Ohio State took over the No. 1 spot in The Associated Press college basketball poll Monday, the first time the Buckeyes have held the top ranking since 1962 when they were led by Jerry Lucas and John Havlicek and on a run of three straight Final Fours. 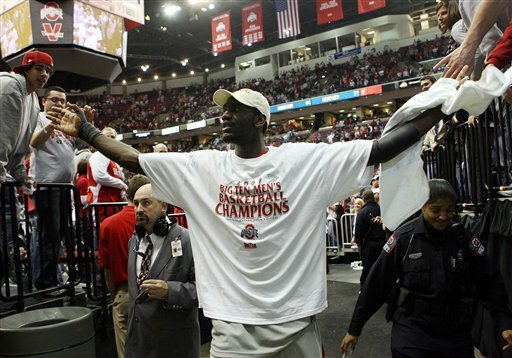 Led by freshmen Greg Oden and Mike Conley Jr., Ohio State advanced one day after beating Wisconsin in a meeting of Nos. 1 and 2. "You hate there had to be a team that lost that game," Buckeyes coach Thad Matta said Monday, referring to his team's 49-48 victory that clinched a second straight Big Ten title. "Fortunately for us we made the bucket at the end and came away on top." Ohio State (26-3) moved up one spot in the rankings, receiving 62 first-place votes and 1,786 points from the 72-member national media panel. It is the Buckeyes' first time as No. 1 in the AP rankings since the final poll of the 1961-62 season. Ohio State was ranked No. 1 for all of 1960-61 and 1961-62, a run of 27 straight polls. The Buckeyes won the national championship in 1960 and lost the title game to Cincinnati in 1961 and 1962. "I think in our situation it's more for the people outside our program to focus on," Matta said. "Our focus, as I said to the team right after the game, is we have to do what got us to this position and that's a day-by-day approach to find ways to improve individually and our whole system as we play. It's odd to win a second championship and still have to play another game and then the conference tournament. It's a big challenge for our guys to go out and find ways to get better." The Buckeyes finish the regular season at Michigan on Saturday, and Matta welcomes a break of almost a a week. "We need the time off since we've been beat up and have been hit by the flu bug," Matta said, adding Ron Lewis and Jamar Butler were bothered by the flu in recent days. "We can take time to get guys back on the right track." Ohio State, which was ranked No. 1 in the coaches' poll last week, is the fifth team to reach the top of the AP poll this season, joining Florida, UCLA, North Carolina and Wisconsin. It's the most teams to reach No. 1 since there were six in 2003-04. UCLA (25-3), which locked up the Pac-10 title this weekend, moved from fourth to second. The Bruins received the other 10 first-place votes and had 1,729 points. Kansas jumped from sixth to third and Wisconsin, which also lost to Michigan State last week, fell to fourth after reaching No. 1 for the first time in school history. Florida, which lost to LSU on Saturday, fell from third to fifth. Memphis, which has the nation's longest current winning streak at 17 games, moved up one spot to sixth, its highest ranking of the season, and was followed by Texas A&M, North Carolina and Georgetown. Nevada and Southern Illinois were Nos. 10 and 11, respectively, both the highest rankings in the schools' history. Pittsburgh was 12th and was followed by Washington State, Duke, Texas, Louisville, Oregon, Butler, Vanderbilt and Marquette. The last five ranked teams were Virginia Tech, Notre Dame, Southern California, Maryland and Air Force. Thirteen ranked teams lost a total of 16 games last week with Wisconsin, Air Force and Alabama each losing twice. Alabama, BYU, West Virginia and Virginia fell out of the Top 25, replaced by Virginia Tech, Notre Dame, Southern California and Maryland, all of whom were ranked at some point earlier in the season. There are seven games between ranked teams this week and three schools _ Duke, Texas and Washington State _ each have two.